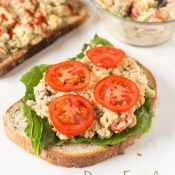 Remember that chickpea taco salad I promised last week? Well, it ain’t gonna happen. I had all intentions of sharing it this week but I went a little overboard when I was styling the bowls for the shoot and it turned into this chickpea taco buddha bowl instead. What’s the difference between a buddha bowl and a salad? I’m glad you asked because I googled it for ya. 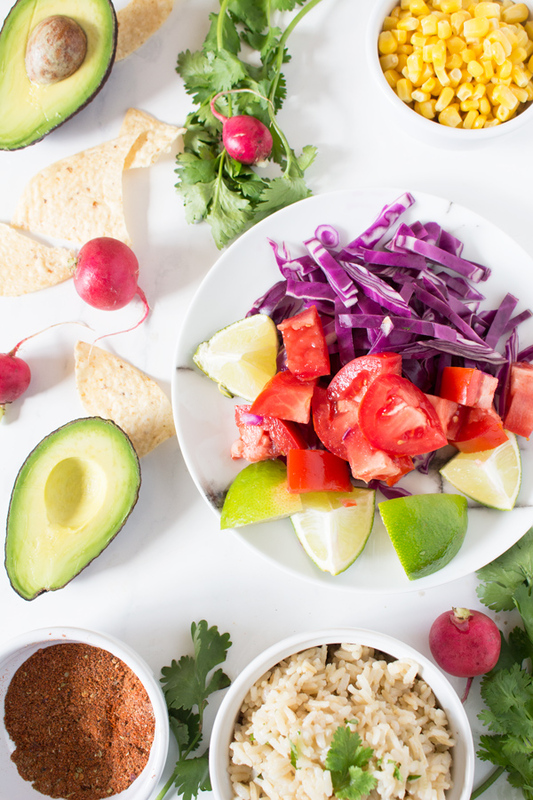 According to the internets, a salad is a cold dish of various mixtures of raw or cooked veggies while a buddha bowl is a bowl packed so full that it has a rounded ‘belly’ on the top, like the belly of a buddha. I’m not sure how I feel about the ‘salads are cold’ definition but I piled all the toppings into this bowl until they were almost spilling out. So I’m thinking this qualifies as a chickpea taco buddha bowl and not a mere salad. And now that that random english lesson is out of the way, let’s talk about what’s really important: the chickpea taco buddha bowl. 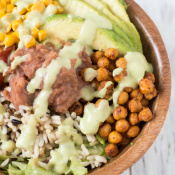 Like all buddha bowls, this one is filled with lots of plant-based goodness. I started with a bed of lettuce but any leafy greens would work just as well. Then I topped it with some rice, red cabbage, sliced radishes, tomatoes, avocado and corn. Finally, I topped it with the chickpea taco filling, which is simple AF but took me more than a few attempts to perfect. I think the problem was that I usually eat my chickpeas plain or roasted because I think they take wayyy too long to absorb any flavour. So with this one, I wanted to take my time and make sure I got the combination of spices just right. 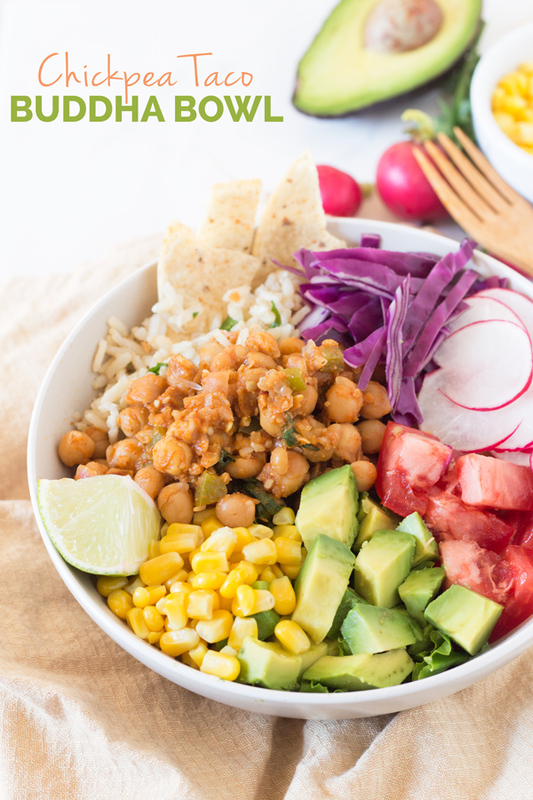 Luckily, I finally got it right this weekend and this chickpea taco buddha bowl, though subtly spiced, is packed with flavour and unbelievably satisfying. 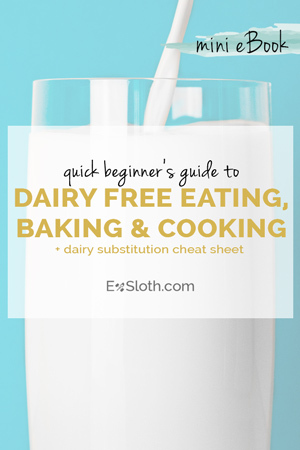 Plus, the chickpeas only need to cook for about 10 – 15 minutes. Needless to say, this will definitely become a staple in my kitchen. 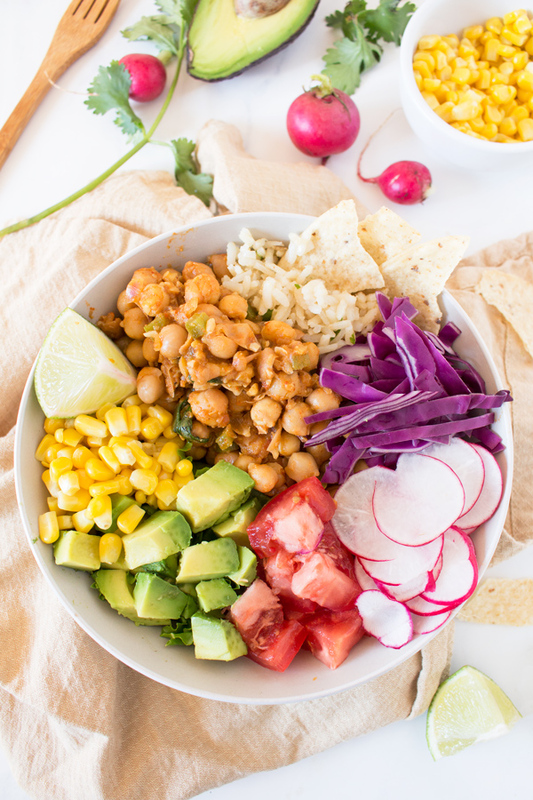 If you make this chickpea taco buddha bowl, I’d love to hear what you think. Leave a comment and rate the recipe or take a pic and tag me @ExSloth on Instagram! 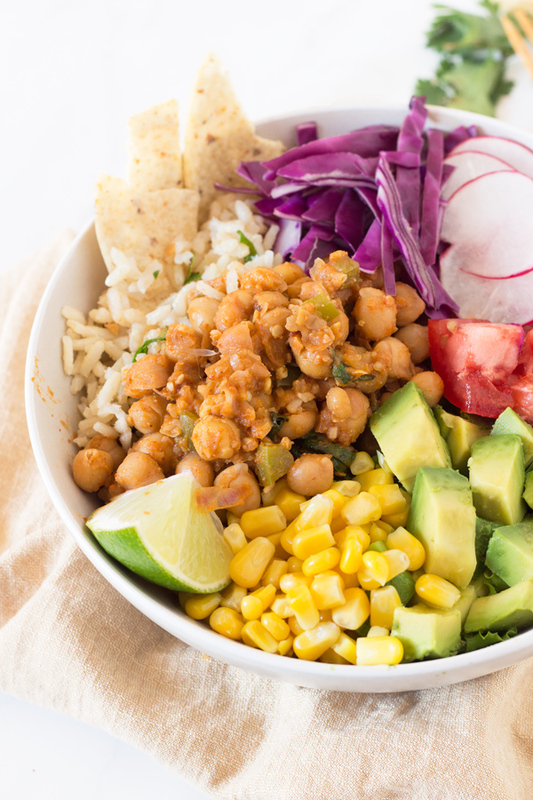 This vegan, gluten-free chickpea taco buddha bowl is easy to make, subtly spiced, packed with flavour and unbelievably satisfying. 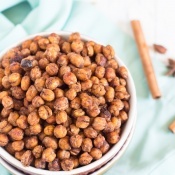 What’s your favourite way to enjoy chickpeas? Anny great meal in a bowl is a POWER bowl to me and this looks delicious!! 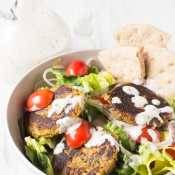 I have all these chickpeas in my fridge – because there is a restaurant that gives you SOOOOO MANY here in LA when you order a side – and I only eat 3 – 5 at a time because they’re so flavorful… SO I could make this salad for DAYS AND DAYS! 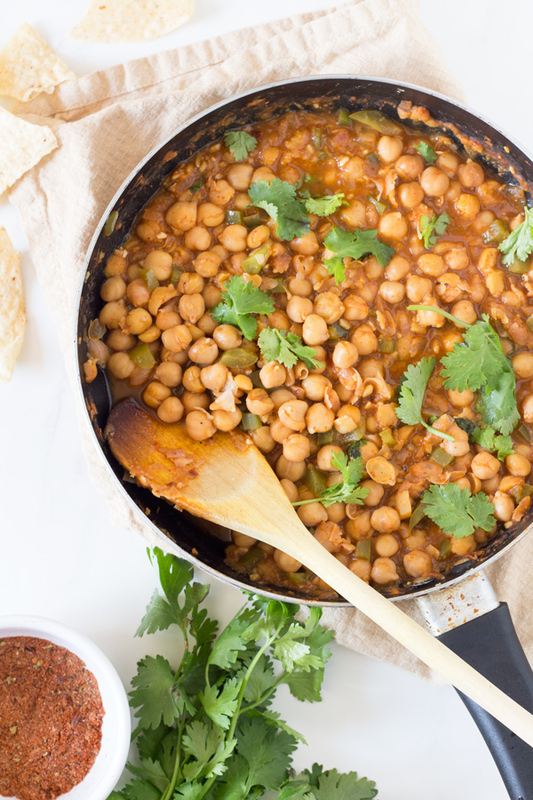 So I always make bowls like this with black beans, but I have a ton of cans of chickpeas that need to get put to use with this recipe! Love making bowls for quick and easy lunches during the week. I love the idea of using chickpeas for the taco filling. That’s so unique and definitely the perfect plant-based alternative. When I saw the avocado in that Buddah bowl, I automatically started thinking of avocado toast. Now I’m craving a thick, hearty slice of toast, smeared with mashed avocado, topped with the taco filling, and drizzled with salsa. I guess I know what I’ll be making for lunch! Can you deliver please? Looks amazing! This looks fabulous! We’ve been eating a ton of bowls lately – Asian, Pizza, Breakfast… this needs to be added to the rotation! This reminds me of an episode of the podcast The Sporkful where he debated the definition of a sandwich – it made my head hurt hahaha. I think for me I call it a buddha bowl/power bowl if there are grains in it, but a salad if there aren’t. Whatever you call this though, it looks delicious. Anything with Mexican flavours and avocado, and I’m sold! Wow, I can’t believe it. It’s so providential, because I think I have all these ingredients!!! Maybe tomorrow’s lunch? Seriously, a power bowl like this would probably keep me satisfied for a lot longer than my ‘snacky’ lunches. That is insanely beautiful! And I’m sure delicious. 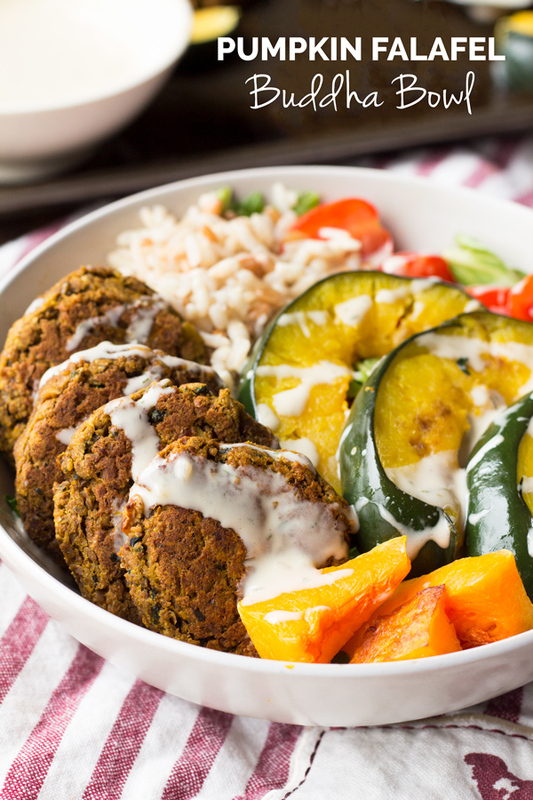 I love power bowls and will make this one asap! I seriously could eat all meals in a bowl…not sure why, is that weird?!? Ive been really into Buddha bowls lately, fresh veggies from my garden, add in beans/legumes, some healthy fat, herbs (I have a cilantro plant too!) and bam…deliciousness! can’t wait to try this! I did wonder why they were called buddha bowls. Thanks for the explanation and I too love buddha bowls. It’s everything you need. This one looks great! I love all the colors I’m looking forward to trying it. Pinned it! . Can the chickpea taco mixture be frozen? Does it thaw well? Thanks!